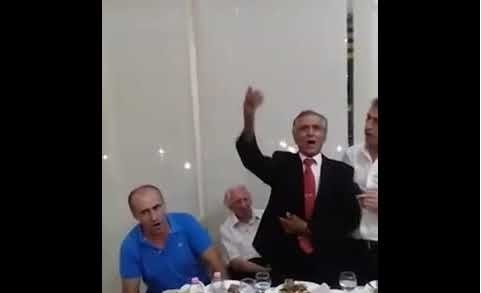 A video featuring the Mayor of Tepelena Tërmet Peçi singing songs dedicateed fo the former communist dictator of Albania, Enver Hoxha is circulating on the Internet, causing severe reactions by the oppossition party, which claims to hold the flag of anti-communism, though a good part of its members are or have been part of the communist system. In these images it is seen of how Peçi accompanies the famous Golik of Bënca, in the song dedicated to dictator Enver Hoxha. The episode in question was marked last night at the official dinner given by the Municipality of Tepelena on the occasion of the 75th anniversary of the liberation of the city. That's enough for the member of DP. So MP Tritan Shehu to react, who has requested in the name of PD the dismissal of the Mayor Peci. Shehu asked to the Prime Minister Edi Rama for Peçi's dismissal, and has described the latter's action as a scandal.